post a link to it! Android and iOS powered devices offer us many features we do not even know about. One of these features is push notifications allowing us to receive personal messages, regardless of our phone number or mobile network operator. MetaTrader mobile terminal already can receive such messages right from your trading robot. You should only know MetaQuotes ID of your device. More than 9 000 000 mobile terminals have already received it. The world around us is constantly changing. Few people remember paging, though it was extremely popular at the time. GSM phones granted us the ability to send SMS messages to any cellular network user and paging was soon forgotten. Can we long for more? Yes, we can! We can expand our opportunities even further with push notifications - the new service provided by modern smartphones. Push technology is widely used in mobile devices powered by iOS and Android OS allowing their users to receive instant notifications from various services in one place. Push notifications are noted for their instant delivery. Besides, there is no need to launch third-party applications and keep them running. Also, push notifications cannot be lost in delivery and users do not depend on a specific mobile network operator. Only the appropriate device and Internet access are needed. A separate ID is submitted in each case preventing users from getting lost in a great amount of notifications. 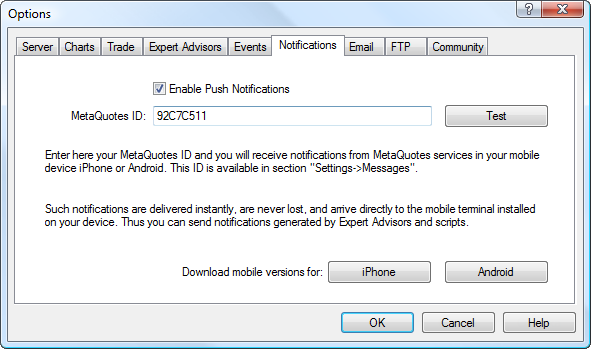 You can find your MetaQuotes ID in "Messages" section after installing the application. The screenshot on the left shows a user ID in MetaTrader 5 for iPhone. Compared to unreliable SMS messages, you are not bound to a specific phone number and the messages are absolutely free. You can receive almost unlimited number of messages. You just need to ensure that your tariff plan includes Internet access. Before the advent of push notifications, traders could use their mobile phones to receive messages about their trading account status, trading signals and other relevant information. To do this, an email was usually sent to a specific address, from which the appropriate message was then sent to a device via paid SMS gateways. But not all mobile network operators provide such a possibility. Besides, the system has several drawbacks. With push notifications in MetaTrader mobile terminals, you can not only trade from everywhere but also use one more convenient way of working with your client terminal providing you with trading signals and important notifications on your account status. MetaQuotes Software Corp. took a step further and integrated new technologies in MQL5.community services. 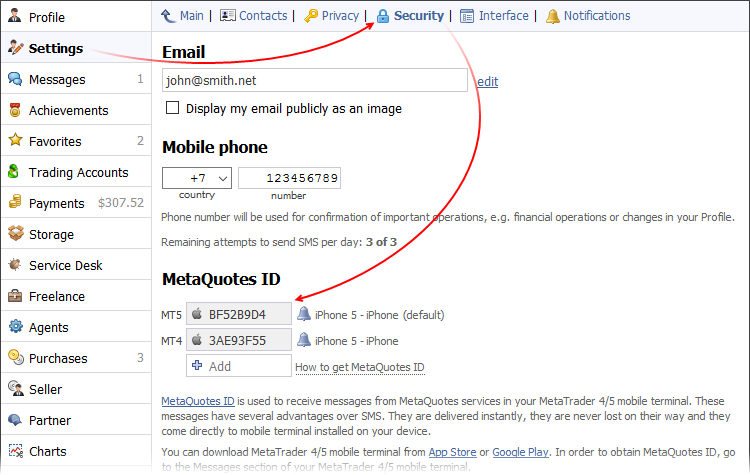 Notifications received by users via MetaQuotes ID can be of two types: notifications from the desktop version of the client terminal and from MQL5.community services. To subscribe for the client terminal's notifications, specify MetaQuotes ID in the terminal's settings. 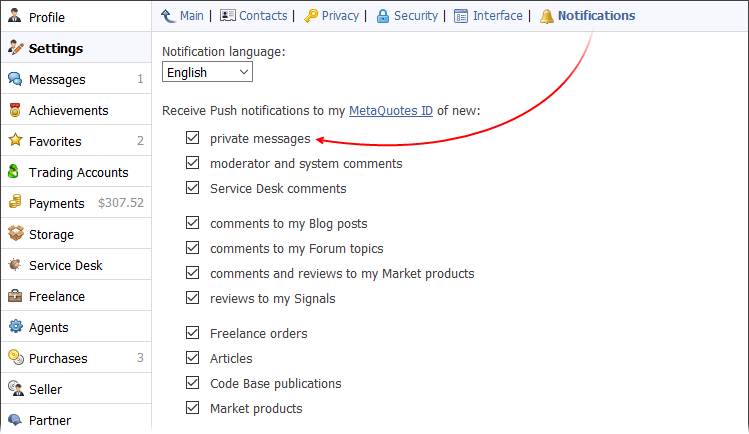 To receive push notifications from MQL5.community, specify MetaQuotes ID in your profile. 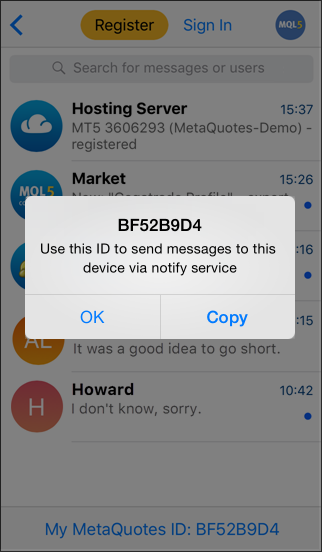 In both cases notifications are sent to a mobile device with a specified MetaQuotes ID via a special server when a certain event occurs. They are delivered instantly. #property copyright "Copyright 2012, MetaQuotes Software Corp."
This sample MQL5 script sends a message to a mobile device with MetaQuotes ID specified in the terminal settings. The only parameter of SendNotification() function is a message text which should not exceed 255 characters. With this function, you will always be in touch with your trading account and Expert Advisor. Forward-looking developers already introduce this feature in their Market products to provide additional convenient functionality. Select "Notification" in "Action" and enter the text that should be sent when a specified event occurs in "Source" field. With this feature you will not miss a single important event. MetaTrader 5 is closely integrated with MQL5.community providing traders with unique opportunities including direct access to Code Base, Articles and Market, MQL5 Cloud Network, MQL5 source codes Storage and more. 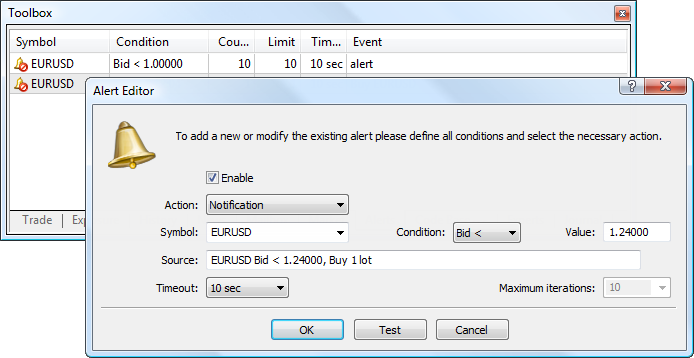 Working in MetaTrader 5 is closely connected with activity on MQL5.community. Then choose events you want to receive notifications about. If you use a static IP address, add it to the list. You won't need to enter a one-time code when visiting the site from that address. In all other cases, a code to login to your MQL5 account will be sent to your MetaTrader 4/5 mobile terminal. 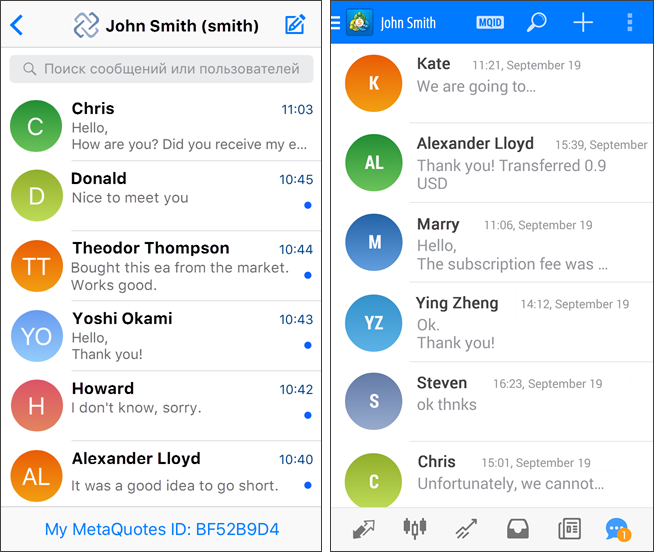 MetaTrader 4/5 mobile terminals include a chat allowing you to communicate with your MQL5.community friends and colleagues right from your smartphone. Being alert to market changes is a key ability of a successful trader. MetaTrader 4 and MetaTrader 5 trading platforms have everything to be up-to-date. Mobile terminals for the most popular iOS and Android OS platforms are available to all traders for free. Sample MQL5 Expert Advisors for creating a message box on a chart are attached below. Place them to the [terminal dara folder]\MQL5\Experts, compile in MetaEditor and launch on any chart. Try to send notifications to your mobile device. You will surely find that easy and convenient. Use push notifications to receive data instantly and securely. More than 9 000 000 unique MetaQuotes IDs have already been registered as of December 2016. Translated from Russian by MetaQuotes Software Corp. Warning: All rights to these materials are reserved by MQL5 Ltd. Copying or reprinting of these materials in whole or in part is prohibited. Please wait for the new build to be released, it is scheduled for today. The issue should be fixed in it. 400.1120 version has been released today on Google Play and it is working fine for me. Hi everyone, I saw the exact same question that I have earlier here in this forum but no answer. So I raise the question again. I have the MetaTrader4 build 1103. Trying to find the MetaQuotes ID that shall be under settings and messages. But I have no messages under settings. Why is that. Do I need to re- install the MT4 app? Please reply with a answer, thank you. Almost all traders come to market to make money but some traders also enjoy the process itself. However, it is not only manual trading that can provide you with an exciting experience. Automated trading systems development can also be quite absorbing. Creating a trading robot can be as interesting as reading a good mystery novel. Having a female member on the MQL5.community is rare. This interview was inspired by a one of a kind case. Irina Korobeinikova (irishka.rf) is a fifteen-year-old programmer from Izhevsk. She is currently the only girl who actively participates in the "Jobs" service and is featured on the Top Developers list. How to purchase a trading robot from the MetaTrader Market and to install it? A product from the MetaTrader Market can be purchased on the MQL5.com website or straight from the MetaTrader 4 and MetaTrader 5 trading platforms. Choose a desired product that suits your trading style, pay for it using your preferred payment method, and activate the product. Every trader works using certain statistical calculations, even if being a supporter of fundamental analysis. This article walks you through the fundamentals of statistics, its basic elements and shows the importance of statistics in decision making.